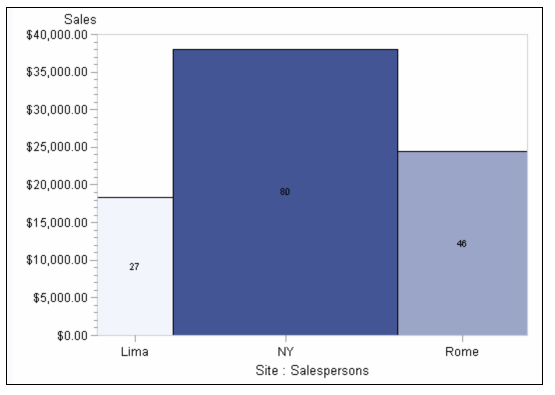 This area bar chart reveals three geographic sites (Lima, NY, Rome) along the horizontal axis. The width of each bar represents the sum of the salespersons assigned to each site. The height of each bar represents the sum of the sales for each site. The chart shows that NY had the greatest sales, as well as the greatest number of salespersons. Set the graphics environment.Specify the ACTIVEX device. Create the WORK.TOTALS data set. Run PROC GAREABAR with VBAR statement. The VBAR statement creates a vertical bar for each value of SITE. The SALESPERSONS variable sets the width of the bars. The SUMVAR=SALES option controls the height of each of the bars.